This superb studio photograph shows Lunsford Yandell Park and his wife, Isabella Ann Eliza Barron Park with their ten children, taken in 1890. 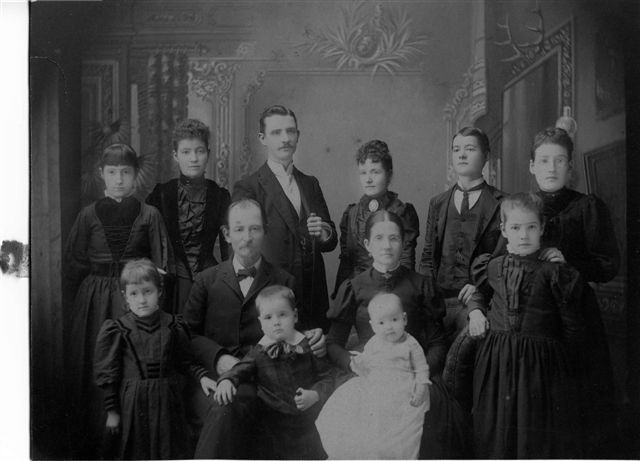 Clockwise from Isabella are infant Louise (born Alma Louise), Richard Lunsford, Lunsford Yandell, Ethel Sloan, Lillian Isabella, Eula Mae, Robert Willie, Annie Laura, Claude Adair, Lena Yandell, and Catherine Wilbur. 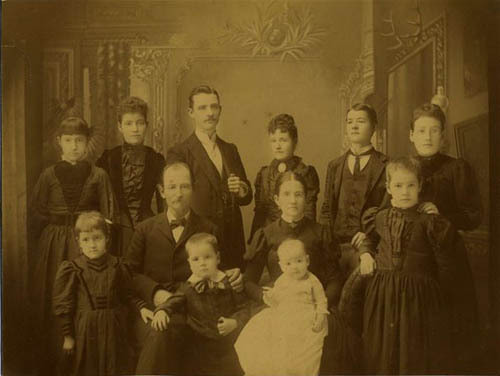 The photo, along with others (including an adult Louise with her two oldest boys), as provided by Louise’s grandson, Harry Park Allen, Jr. Click on the photo to visit a black-and-white version that shows some features more clearly. This is a public Web site, not a private one (if there is any such thing). All information is open to view to anyone using the Internet. Please contact the Webmaster at ParkFamilyReunion.net if you have any questions or wish to update any pages (you can build the email address by replace the word "at" with the so-called "at sign" and removing the spaces). Not all Web-based information sources are consistent or reliable, and we urge Park family members to provide corrections wherever they find a discrepancy. For example, many death dates come from the Social Security Death Index (SSDI), while other dates come from various records, including newspaper obituaries. Some dates may be in error, and there are doubtless some gaps. Please contact the the Webmaster at ParkFamilyReunion.net if you have any questions or wish to update any pages if you have any information that can help with this list (you can build the email address by replace the word "at" with the so-called "at sign" and removing the spaces) . To thwart the misuse of these names by non-family members, the birth years of living people have been replaced by the word "living." Should any of these be inaccurate, please let the webmaster know the year of demise. When we started this Web site back in 2005, we were just going to focus on descendants of Lunsford Yandell Park and his wife, Isabella Ann Eliza Baron. The pages would therefore be called “The Park / Baron Genealogies.” To our very great delight, we've had so many cousins check in from other lineages that we realized we had to expand our scope to include descendants of Lunsford’s grandfather, James Park (1785-1866) and his wife, Martha Yandell (1785-1851), for which we are grateful to cousin Rollie Taylor. We have also added a Yandell genealogy. Many of our cousins have visited, inquired, and contributed genealogical information, so we're now expanding our scope even more, to include descendants of Moses Park (1738-1828) and his wife, Mary Hill (1749-1829). Thanks to Nancy Schwartz, a descendant of Moses’s son, Thomas Park, we now have a page for Thomas plus a page for Thomas’s grandson, Josiah Andrew Park. Both pages will be expanded in due course (along with hundreds of other names still waiting in the wings). Nancy also supplied some photographs, and we've implemented links to them from the names on the Josiah Andrew page. Links to photographs will be in green, with text of the names in small capitals. Stay tuned for further developments! Cousin Jessica Aileen Caldwell supplied some needed information concerning her lineage from John Moore Park, and after a bit of research, enough Caldwell lineage was identified to justify breaking out the Caldwell line. We've provided links between those two pages. Cousin Amy Marks contributed her discoveries tracing her ancestry back to Noah Park, the younger brother of Moses Park. Thanks to The Parke Society’s archives, we’ve been able to trace our lineage back to Roger Parke and his wife, Ann Patison, who settled at the ill-fated Quaker community known as Hopewell Township, NJ, around 1684. This pushes our line back to Moses Park’s great grandfather. Stay tuned for a description of just why Hopewell was doomed (and at whose hands), and the reason our family migrated south in the early 18th century. If you have any genealogical information you’d like to post on this site (names and dates, for genealogies, scanned documents, and especially photographs), please send me a note. The Parke Society is a surname organization that helps descendants of immigrants from the British Isles whose last name was Park, Parke, Parks, or Parkes. The Society publishes a Newsletter three times a year (your Webmaster is the current editor), and has a lending library of Park/e/s-related genealogical materials, as well as a DNA project for those who wish confirmation of their ancestry. Just click on the link in the navigation panel, or the one in this paragraph (highlighted). Who are you? Which Park do you come from? Where do you fit in with this expansive and ever-expanding family? Take a look at the Park genealogy pages. If you're a branch, a twig, a leaf, or a growing bud on this ever-growing family tree and we haven’t included you, let us know and we’ll put you right in: just let us know where. And if you've got names, dates, stories, or family photographs you’d like to have on the site, send us a scan. Click on this line to read Cousin Ed’s account of how the 2005 reunion all came together.